Time to turn in my card. If I was a card carrying member of some candy reviewers regime I would have to quit. 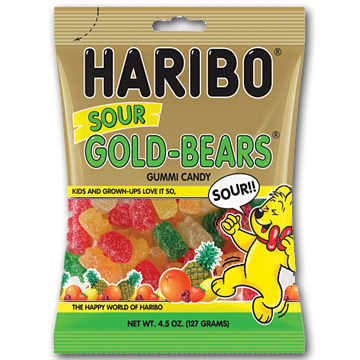 Because how in god’s good name did Haribo put out some SOUR gold bears and I had to be like walking in some godddam store in the middle of godknowswhere to find out they even EXISted? Actually, I blame Haribo. Have they NOT ever trolled our site and seen the absolute goo goo eyes we give to anything labeled “Haribo”? Have they not seen how Haribo is the scale AT WHICH WE MEASURE ALL OTHER GUMMY CANDY? So of course I finished the bag without really tasting all the flavors because that’s how I roll with Haribo bears, man. I just dig in and pretend I’m about to die and there’s no more Haribo anywhere and especially not in hell where I”m likely going because Haribo is heavenly. Can’t tell the flavors though. I see on the package there’s pineapple in there. Cool. Kinda can taste it… I can taste the lemon for sure – kinda lemonhead-y. The sour…well, I gotta be honest, the sour isn’t super sour. More like “really tart.” These aren’t your novelty warheads, nor your benchmark Sour Patch Kids but they make you pucker a bit and with the good ol’ Haribo chew and charm, who can complain? I think I read on another blog that this flavor is being kicked into the grouping of varieties that will be exported to the US going forward. So eat freely, young’un. Eat freely. 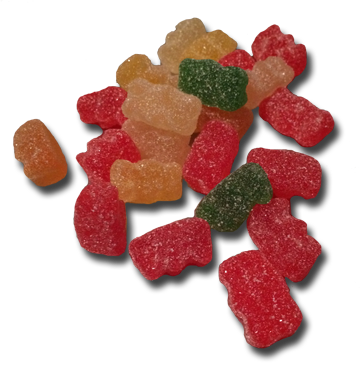 I just polished off a bag of these last night.. the “sourness”flavor definitely reminded me of sour patch kids but unfortunately they were not as soft and chewy as a sour patch kid.. i still loved them though.